MADNESS frontman Suggs has chosen a Town Hall-run swimming pool for the subject of a documentary about historical gems around Britain. 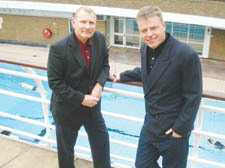 The Oasis outdoor pool in Endell Street, Covent Garden – which served as a water tank for the Fire Brigade in the Second World War – is ­celebrated in the ITV series, Suggs’ ­Survivors. The show features the singer looking for the architectural oddities that cast light on how we used to live. Suggs – real name Graham McPherson – said the council-run ­outdoor pool was a London treasure. There has been a pool on the Oasis site for hundreds of years: records show a ­Turkish bath was built there in 1728, to be replaced by the Bloomsbury Baths and Wash Houses in 1852, which included two indoor pools. After the war, the emergency services water tank was converted into a pool with parts of old air-raid shelters used to create diving platforms. Suggs’s special affection for the swimming pool stems from childhood memories. The programme ­features interviews with long-term users of the pool and a former manager, Peter Stechman, who looked after it in the 1980s. May Brightley, 93, recalls swimming at the baths in the 1920s, where she won the Sir Oswald Stoll Cup. And longest-serving member of staff Charlie Dubuisson, who has been in charge of the baths laundry since 1965, is also included.